If you want to study in the US and are not a US citizen you will need to obtain a student visa. Applying for a US student visa can be a long process, so make sure you start preparing well in advance – at least three to five months before your course is due to start. 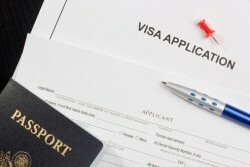 There are usually several steps to apply for a US student visa. These steps vary at each US embassy or consulate so it’s important to consult the instructions on the website of the embassy or consulate where you intend to apply. Accreditation is important as it ensures your degree is recognized by other universities, professional associations, employers and government ministries worldwide. Only SEVP-approved institutions can enroll students in the Student and Exchange Visitor Information System (SEVIS) and provide you with the documents necessary to apply for a US student visa. Use the government’s Study in the States website to identify accredited institutions. The SEVP manages international students in the F and M visa classifications, while the Department of State (DoS) manages Exchange Visitor Programs and international students on J visa classifications. Both SEVP and DoS use SEVIS to track and monitor institutions, exchange visitor programs and international students. You must pay the SEVIS fee at least three days prior to submitting an application for a US visa. In order to pay the fee you’ll need to file either an online or paper form. Both can be accessed through the US Immigration and Customs Enforcement (ICE) SEVP website. Take care to input the required details exactly as they appear on your I-20 or DS-2019 form. At the time of writing the I-901 fee is US$200 for F/M visa holders and $180 for J student visa holders. J visa holders working as camp counselors, au pairs or in summer work/travel pay $35 instead. The website explains the procedure for different types of payment including debit or credit card, check, international money order and Western Union Quick Pay. Having paid the fee you can return to the website to check on your payment status if desired. A third party (such as your sponsor) can also pay the fee for you. If the fee is paid on your behalf you should receive a receipt from that third party. Most countries have their own dedicated website for everything to do with making a US student visa application, which can be accessed from this main page. If you cannot find your country in the list, you may still be able to find the US embassy or consulate in your country using the US embassy’s website. You’ll also need to upload a suitable recent photo of yourself in the format explained in the photograph requirements. If your photo upload fails you’ll need to take a printed photograph, which meets the requirements, to your visa interview. Take care to answer all the questions accurately and fully as you may have to reschedule your visa interview appointment if you make any errors. If you get confused when filling in the application form you may find answers to your questions on the travel.state.gov website. Once the visa application form is completed, you’ll need to electronically sign your DS-160 by clicking the “Sign Application” button at the end. After your application is uploaded you’ll be sent a confirmation page with a barcode, barcode number and your application ID number which you’ll need to print out and take to your visa interview appointment. You do not need to print the full application. 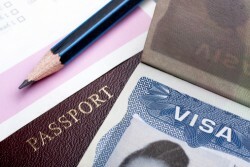 The visa application process cannot be completed until you appear for an interview with a consular officer. Don’t worry if you need to schedule your interview appointment at a different US embassy or consulate than the one you used to apply for your visa. The barcode from your DS-160 can be used to retrieve your information in any US embassy or consulate. However, be aware that it may be difficult to qualify for a visa if you apply outside your place of permanent residence. Wait times for visa interview appointments vary by location, season and visa category. After your interview the consular officer will tell you if your application requires further administrative processing – this can mean additional time for you to wait to receive your visa. Wait times will vary depending on country. You will also be informed how and when your passport with the visa will be returned to you (usually pick-up or delivery by courier). In some countries the courier company will send you an email with a tracking number which you can use to track the delivery of your passport. F-1 and M-1 visas can be issued up to 120 days in advance of your study start date, but you will not be allowed to enter the US earlier than 30 days before your start date. J-1 visas can be issued at any time. If you want to enter the US before these 30 days, you must qualify for and obtain a visitor visa. The 30 day limitation does not apply to students returning to resume studies – they may enter the US at any time provided they have a valid visa. If arriving in the US by plane, you’ll need to fill in a Customs Declaration form (CF-6059) before you land. You can ask a flight attendant for help if you don’t understand the form. You will also need to fill in an Arrival/Departure Record I-94 form, online or paper form. Your US student visa is valid until the date shown on your visa. The CBP officer will record a separate date or “D/S” (duration of status) on your I-94 form. This is the date by which you must leave the US. You may stay in the US until this date even if your visa expires during your stay. However, if you depart the US with an expired visa, you will need to obtain a new one before being able to return and resume your studies. 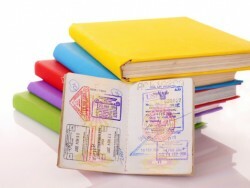 A student visa cannot be renewed or re-issued in the US; it must be done at a US embassy or consulate abroad. If you are given a paper I-94 form make sure to keep it safe in your passport as you’ll need to return it to a CBP official when you leave the US. If you have an electronic I-94, a CBP official will instead record your departure using manifest information obtained from the air or sea carrier with which you are travelling. You should report to the office in your institution which is responsible for assisting international students within 30 days of your course start date, as this appears on your SEVIS I-20/DS-2019 form. This could be the Office of International Services, the Office of International Education, the International Programs Office, or similar. A Designated School Official (DSO) will validate your intended participation by reporting your arrival to the SEVIS system. This must be done within the 30 days or your record on SEVIS will be automatically terminated and you may be considered to be in violation of your status in the US. All students must depart before the date on their I-94 form/stamp. Failure to depart the US will cause you to be out-of-status. Being out-of-status in the US is a violation of immigration laws, and may cause you to be ineligible for a visa in the future. If you wish to extend your stay you’ll need approval from USCIS. If you’re a continuing student you may renew your visa at any time, as long as you have maintained your student status and have current SEVIS records. This article was originally published in December 2013. It was updated in February 2016.